A collection of revelations given primarily by Joseph Smith, and a few others. Part of the "Standward Works". For 86 years the lectures were part of the canon until they were removed in 1921. The lectures reflect Joseph's earlier views before they evolved into polytheism. Section 2 is absent in the first two editions (1833, 1835), and was inserted afterwards and back dated to make it seem that the angel Moroni had promised the priesthood in 1823. 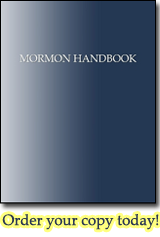 When Joseph wanted to be the Prophet, Seer and Revelator of the church, the original revelation was later edited to remove its restriction that Joseph would only have one gift: to translate the Book of Mormon. This "revelation" that Joseph Smith received the Aaronic Priesthood is not in any of the earliest editions of the Doctrine and Covenants. In fact it wasn't published until 13 years after the event and back dated to May 15, 1829. Three verses were added to the original revelation on church organization concerning the priesthood. The original revelation was edited to insert language that Joseph Smith had already received the priesthood years earlier. The original revelation was edited to insert the word presidency, an office the Bible and Book of Mormon do not mention. For 41 years this revelation explicitly prohibiting polygamy was part of the canon until it was removed in 1876 to make room for Section 132 endorsing polygamy.